Music Costs > How Much Does a Trombone Cost? How Much Does a Trombone Cost? Trombones are considered to be simple brass instruments that have been around for more than six decades, and it is known as being the only modern orchestral brass musical instrument that has the ability to play all the notes of the chromatic scale. Extremely versatile, trombones are commonly used in a variety of ensembles including orchestras, marching bands, and even in rock bands. The cost of a new trombone is going to really depend on the condition, the brand and the type of trombone you are looking to purchase. On average, the prices of a trombone can range anywhere from as little as $300 for a student version to as much as $9,000 for a professional brand. For example, alto trombones can retail for $300 to $4,000 while a small bore tenor trombone can cost $700 to $3,500 brand new. On the other hand, medium or large bore trombones can retail for $1,500 to as much as $5,500. At Guitar Center, the top sellers retail anywhere from $179 for a student version to as much as $7,000+ for a professional bass trombone. Although there are a variety of trombones on the market, there are three main types: the straight, trigger-type and bass. The simplest, the straight tenor, won’t contain any tubing on the inside, while the trigger-type will have an extra tubing within its main loop, creating a longer shape. The bass trombone will have a larger bore and will also contain a second rotor, which can extend the horn’s low end even further. The bore size, which is the diameter of the trombone’s tubing, will vary in size. The bore size will affect the aspects of the instrument, greatly affect is playability and the sound it can produce. A smaller bore horn, usually .500” to .525″ in size, will be designed for students, while a larger bore, usually around .547″ in size, will create a fuller and better sound. As for the finish, the bells can be made of either yellow brass, red brass or silver, with yellow brass being the most common. A trombone mouthpiece may be needed if you either want to upgrade it. A good mouthpiece can cost anywhere from $35 to $190, depending on brand, the material and features. Generally, those who want a broader and deeper mouthpiece, which is known to create a richer tone, will upgrade to a deeper mouthpiece. Also, if you’re buying used, it’s wise to buy a new mouthpiece as well. A good, sturdy trombone case can be purchased for $100 to $800, depending on brand, capacity and features. Trombone cleaning agents, such as the slide oil and slide lubricant, can cost $5 to $30. Shipping costs vary from one retailer to another. If free shipping isn’t included, then be prepared to pay $40 to $60. Be prepared for some repairs in the future such as slide repair, a common problem when the slide is sluggish. This type of repair, for example, could cost $20 to $50 at a local music shop. Lessons can cost anywhere from $20 to $50 per hour if you were to need them. Used trombones can cost less and are usually available at some music retailers and online via eBay and Craigslist. If you’re going to buy used, always be sure to test the instrument first and only purchase from a reputable seller. Even if it isn’t in the greatest cosmetic shape, you can always refinish the metal and/or take out dents to make it look new again. It is often a practical idea to rent a trombone for some time in order to get a feel for the instrument before you buy. Many music retailers allow you to rent this instrument for an indefinite amount of time for as little as $20+ per month. 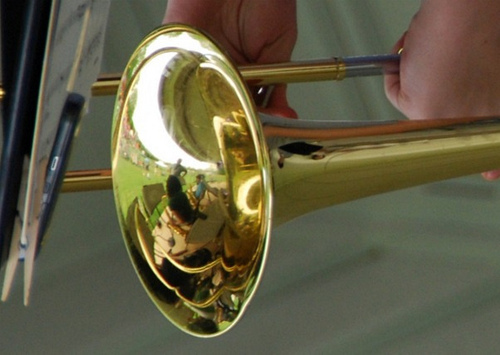 Lease-to-own trombones may also be an alternative to buying or renting. Make sure to read and understand the terms and conditions involved in this type of arrangement. If you’re just starting out and you want to invest in an instrument, highly consider a student model and starting out small before investing thousands in a name brand. On Amazon, for instance, highly rated student trombones retail for $100 to $150.